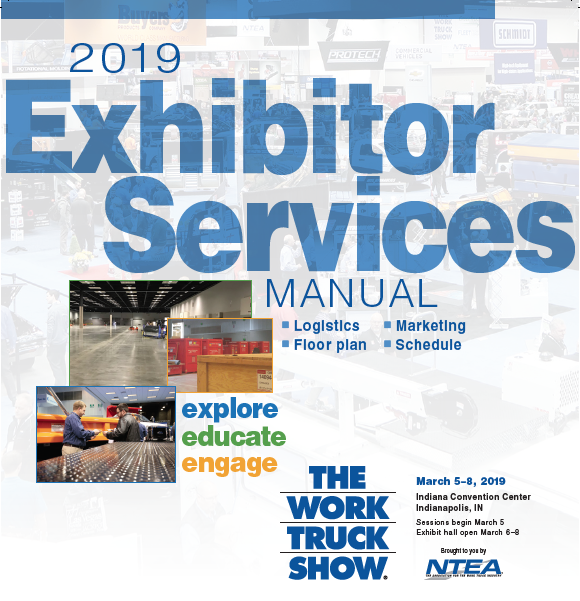 The Exhibitor Services Manual contains critical forms and details relevant to planning and preparing your booth for The Work Truck Show. Also included are valuable marketing and promotional opportunities available exclusively to exhibitors. Attention new exhibitors: Download new exhibitor pavilion services manual. Exhibitors can order Freeman products and services online, including carpet furnishings, labor, cleaning services, shipping services and more. All downloadable order forms within the Manual are accessible via Freeman Online. Please note: exhibitors will have to log in to view all Show content and place orders. Contact us NTEA staff is prepared and available to address any questions you have and to do everything possible to make sure your experience at The Work Truck Show maximizes the investment your company has made. For more information regarding exhibitor services, please contact Michelle Kubitz, director of events, at 248-479-8192 or email michellek@ntea.com.